Copyright (c) – Smith Music Company Ltd. Recorded live in the Tempodrom Berlin, November 2002. Tracks DVD1-11, DVD1-19 have "hidden" video / audio versions. Disc 2 includes an interview and a "hidden" interview. On the "Disintegration" menu, highlight Plainsong, and click to the left. 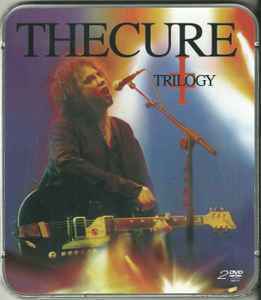 Click on that and see a split screen version of Plainsong from both nights, shot by Robert's handheld camera. Still on the "Disintegration" menu, highlight "Same Deep Water As You" and click to the left. Click on that and watch Same Deep Water As You from the "Robertcam" (much like the Sinkingcam on the Dream Tour). Go to the Interview menu, highlight "End Of An Era?" and click to the left. Click on that and you get some outtakes from the interviews. DVD 1 : Approx 122 min. DVD 2 : Approx 116 min. Released in square tin box with custom shaped card seal. The encore set is not credited on back sleeve.